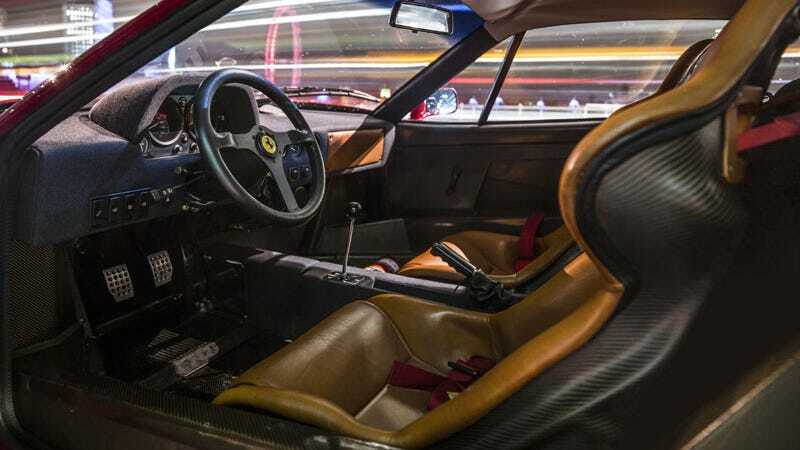 Nearly all 1,311 Ferrari F40s built between 1987 and 1992 went to their lucky owners from the factory with a stripped out interior and a Rosso Corsa paint job—except for a select few which did not. The F40 was a huge deal for Ferrari. Designed to be a celebration of their 40th anniversary as well as something that they could keep racing, it also turned out to be the last car signed off by Enzo Ferrari himself. Back in 1987, Ferrari claimed all F40s would be left-hand drive and delivered in red without any options apart from the adjustable suspension, and that the factory won’t support any individualization. Then came the Sultan of Brunei with a large bag of beautiful money in 1992, but you weren’t supposed to know that at the time. Or ever. If you just had your back broken by your brand new F40’s bucket seats, you also weren’t supposed to hear the rumor that the Connolly family got Ferrari’s blessing to re-trim the 1991 UK-spec F40 with the finest leathers the dynasty is known for. I guess being a Ferrari supplier had its benefits. Of course today, anybody can replace the factory seats without Ferrari raising even an eyebrow, but this remains the one and only Connolly F40. It went under the hammer today but failed to sale in the end at The Duxford Auction by H&H, where a 1967 Ferrari 275GTB/4 and a 1960 Ferrari 250GT SWB from the Richard Colton Collection sold for £1,930,000 and £6,600,000, with the money benefiting the Royal National Lifeboat Institution. H&H estimated this 18,799 mile F40 at as much as £800,000, or about $1.23 million. I guess that was too much, even with the nice leather.